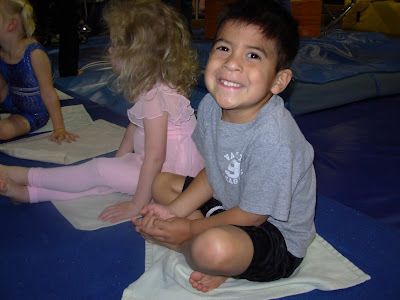 Miah had his parent observation day in gymnastics last Tuesday. He was VERY excited about me watching him. He's look up for me after every trick to make sure I was watching. I was very proud but not as proud as him. 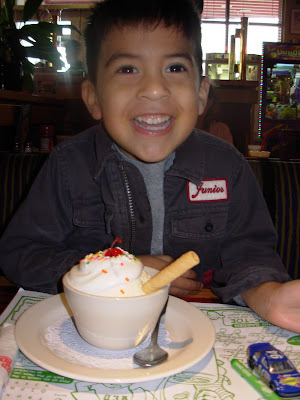 Afterward we celebrated Miah's good skilz at Red Robin with yummy food. Izey knawed on melon. I figure it can't hurt right? Miah enjoyed ice cream but only by looking at it. Darn nut wouldn't eat it. Made me wanna pull his ears off. But whatever. Here is some motion of the skilz. What do you mean, "last" Tuesday?!?! Dude, it was only yesterday!!! What is going on with your brain lately?!?! Who's kid is Miah anyways? Who doesn't like ice-cream?!? I'm sure you didn't have a problem helping him eat it! Why won't he eat ice cream? But why won't he eat Ice Cream? How fun! He looks great out there. George wants to do that instead of dance class, "cause he gets ice cream". I got your comment to my blog. Yea, when we saw that picture on your blog (told you I was a stalker) from Christmas, the twins are dying to get one. Oxygen, my mother had pneumonia and she is home on oxygen, cause the hospital stinks and I complained complained, she has 2 masses on her lung, so next step is to make an appointment with a pulminologist. Is Miah afraid of Ice Cream? What is going on here? Is he watching his weight? Oh my!!!! Lovin' the skillz! I was in gymnastics at that age too. I would go to the old Rockwall High School and learn round-offs in the gym. Not that this is of importance here...but just thought I'd share! Loved watching the gymnastics video! And really, I came over here to tell you thank you SO SO SO much for coming to see me today for my birthday. It meant the world to me for you guys to come and I'm already dying to get together again! 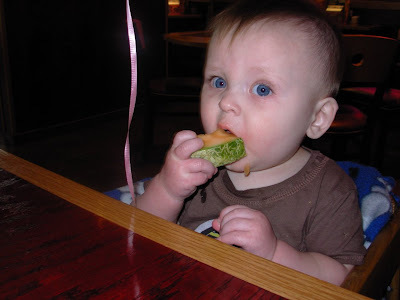 that picture of izey holding the melon is adorable... i love the way his chubby little fingers are grasping it. And why is everyone so concerned about miah not eating the ice cream? maybe he's just not that into it!! lay off 'em...i think it might be a mexican thing... enos doesn't really like ice cream either... well.. that is, he's lactose intolerant. Yipee Miah!!!!!!!!!! It's Mawmaw from Hooters...I love the Gymnastics shows....thanks Jess for putting them on so I could clap for my Miah. Klyde, I see mutha's photo with her comment, umm she's not wearing orange shorts. Maybe you're not telling the truth about her occupation. Fine. Whatever. Maybe it really is the Mexican thing, because I don't really care that much for ice cream either. I mean, I'll eat it if that's my only option for dessert, but I would never, ever choose it. LOVE the videos! He's a doll.